EPA sets high standards for mold removal, and Platinum Restoration adheres to them all. We understand how mold growth can endanger your family’s health and the structural integrity of your home, and we take our job seriously. Therefore, our technicians carefully follow a 5-step process to achieve total mold removal and home repair. Here are Platinum Restoration's 5 steps to a safe home. It is critical to assess the severity of the problem before beginning the cleanup process. 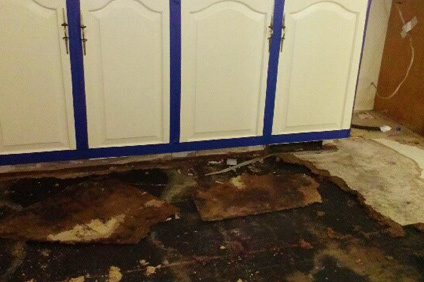 Our experts will check not only the surface areas, but also every nook and cranny where mold growth can hide. Mold feeds off cellulose as well as moisture, and it is not unusual for us to find it thriving unseen between drywall and framing materials. Mold spores growing in one area of a commercial facility can easily “travel” to other parts of the building through the ventilation system: causing additional contamination as well as headaches. It is absolutely essential to contain the mold growth at the source and prevent it from spreading before the removal process begins. Our team of mold removal experts has the skills and the tools necessary to successfully contain the problem according to industry standards including EPA, IICRC S520, NYC, and OSHA. In conjunction with our other containment procedures, we use engineering controls that utilize “negative pressure” technologies and air filtration to further prevent air-borne mold from spreading during the removal process. It is a highly effective step that helps to guarantee that mold spores stay put until they are eliminated. 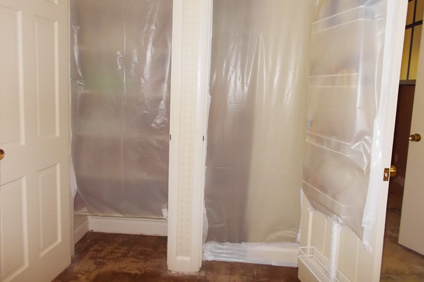 Once containment has been successfully achieved, depending on the results of the assessment and the seriousness of the problem, we proceed with mold removal. If mold exists within and behind walls or ceilings or under flooring, it may be necessary to remove problem areas altogether: drywall, carpeting, ceiling tiles, roofing, etc. Our goal after completing mold removal services is always to return your facility as closely as possible to its pre-loss condition: like nothing ever happened. Platinum Restoration serves Medina, Erie, Huron, Lorain, and Cuyahoga counties in Ohio.